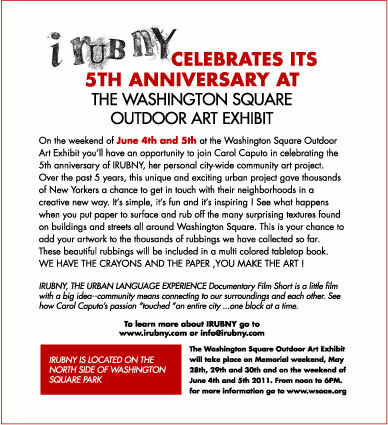 IRUBNY community arts initiative joins the Washington Square Outdoor Art Exhibit on June 4 and 5. Celebrating its 5th anniversary, Carol Caputo’s city-wide community art project explores the City’s streets for textural interest and creates abstract works by putting paper on a surface and making a rubbing with crayons. This is your chance to make rubbings from surfaces around the WSOAE show and to create artwork to be collected for inclusion in a “multi colored tabletop book.” IRubNY provides paper and crayons. Join IRUBNY and Carol Caputo on Saturday and Sunday, June 4 and 5, at WSOAE Booth AW 7 (University Place between East 8th St and Washington Square North). Exhibit hours are 12 noon to 6pm. Come rub the neighborhood!